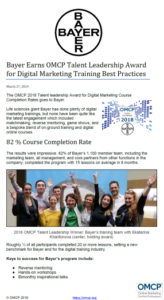 In keeping with the OMCP mission to continually improve the standards of practice, education, and employment of online marketers, the association recognizes excellence in training and application of the standards. See the P&G announcement here and the Bayer announcement here. Prior winners include digital marketing agencies GTB and MediaCom. For 2019, OMCP has opened a category for in-house teams for excellence in Talent Leadership. Awarded companies have made significant investments in staff training and certification in online marketing practices. Clients of awarded agencies are assured that agency staff have the verified hard skills, education, and experience set by by the industry. 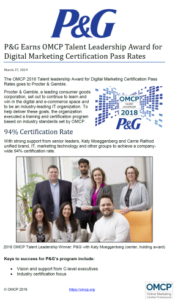 Criteria: Company or agency must employ 10 or more staff that practice online marketing, digital advertising, or digital media services that include at least four of the disciplines covered by the OMCP competency and certification standards. Training or exams must have taken place in the calendar year 2019. 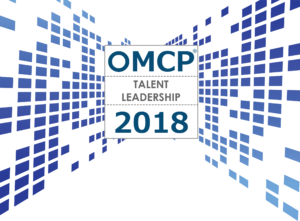 To nominate a team, company, or agency, or to apply for the OMCP Talent Leadership Award, email a completed application form to info@omcp.org or use the form below to put an team in the running. OMCP will confirm application with the listed contact and provide an official entry form. Deadline for 2019 applications is set at February 16, 2020. Winners will be announced in March 2019.